So many thirteen-year-old girls are so self-conscious about and self-identified with their looks that they’re terrified to get up in front of a crowd lest anyone notice their imperfections. Ah, but those with screamingly obvious imperfections (i.e., physical deformities) are often more mature in their outlook because they’ve learned that true beauty is found within, not without, and they don’t define themselves simply by the way they look. The last time you went to Home Depot, you may have passed a potential star in the Ceramic Tile aisle. If singing competition shows are any indication, there are plenty of talented dads out there who have, for the most part, put their performing dreams on hold while they raised a family. Ultimately, of course, helping children grow up is a nobler choice and infinitely more satisfying than singing to sold-out auditoriums, but still the itch remains. If you are a singer, you must sing. It’s who you are, and sooner or later, that part of you will demand expression. When Jeffrey Adam Gutt stepped on the X Factor stage on September 20, 2012, he was singing for his life. At thirty-six, Gutt, a single dad with a four-year-old son, was almost out of chances. He was barely making ends meet and needed to make something good happen fast. As he noted before he sang, failure was not an option. Carly Rose to the Occasion! Jillian Jensen’s X Factor audition on September 12, 2012, was noteworthy not just because she sang so authentically with such raw emotion, not just because judge Demi Lovato got up out of her seat and embraced the sobbing twenty-year-old after her song, and not just because most of the audience was crying along with Jillian. Mild-mannered Jahmene Douglas stepped on the X Factor stage in Britain on August 18, 2012, but as soon as he started singing he turned into Superman. As the last note of his song faded into the night, he once again assumed his secret identity of a nervous twenty-year-old supermarket clerk. Seriously, his transformation before and after his performance was astonishing. It was a joy to behold. Jahmene is one of those rare people who have been blessed with the magical ability to totally lose themselves in their music and effortlessly express the deepest, most authentic part of themselves. Every note he sings strikes a chord of resonance and recognition in those who are fortunate enough to hear him sing. When Jahmene sings, you don’t just listen with your ears, your whole body reacts. This was Daryl Markham on the day he should have been at his X Factor audition last year . . . beaming with pride as best man at his brother’s wedding. Danyl Johnson: A Star Is Born! Danyl Johnson gets by with a LOT of help form his fans! Twenty-seven-year-old school teacher Danyl Johnson rocked the house on Saturday, August 22, 2009 with this Joe Cocker version of With a Little Help From My Friends on X Factor, Britain’s version of American Idol. It only took the audience three seconds to realize that they were witnessing something special. You can have all the talent in the world, but if you can’t connect to the audience like Danyl does, you won’t get very far. Okay, Danyl, I’ve been doing this for how many years? Eight, nine years? 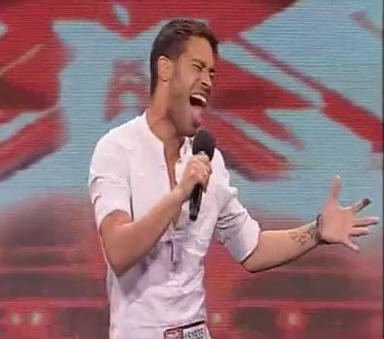 Okay, Danyl, that was single-handedly the best first audition I have ever heard.